ScoreHero :: View topic - 10/18 DLC: Of Mice & Men Pack 01! 10/18 DLC: Of Mice & Men Pack 01! Posted: Tue Oct 23, 2018 5:29 pm Post subject: 10/18 DLC: Of Mice & Men Pack 01! Go hard with Of Mice & Men Pack 01 in Rock Band 4! Of Mice & Men Pack 01 is led by Back To Me, a single from their 2018 album Defy. The bands fifth studio album continued a string of successes for the band and had strong showings on both the Billboard Top Hard Rock Album and Top Rock Album charts. Back To Me was initially released ahead of the album, and built up tons of excitement from fans. Led by a powerful guitar riff, Back To Me seamlessly moves between clean verses and heavy choruses, with big drums and riffage in spades. Vocalists will have plenty of fun with the harmonies, which feature the backing lines on a different part than the lead vocals. 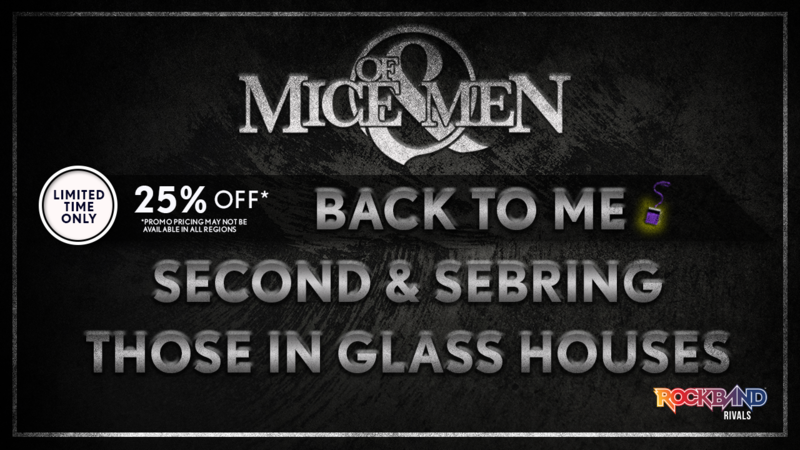 Weve also got Second & Sebring and Those In Glass Houses, both tracks from Of Mice & Mens self-titled debut. The band signed to Rise Records off the strength of their demos, and it showed in this popular debut, reaching the top 10 on the Billboard Top Hard Rock Albums chart. Second & Sebring goes hard, with screaming vocals alternating with clean, pounding drums, and a tough, quick guitar pattern. Those In Glass Houses is also a gauntlet, squeezing a challenge into a sub-3 minute track. Drum fills come hard and fast, kicks are constant, and guitar strumming changes throughout. All 3 of these tracks will test you, so be sure to get your warmups in before going into them. Be sure to visit www.ofmiceandmenandmenofficial.com for Of Mice & Men news, upcoming tour dates, merch, and more. While youre there, be sure to catch the music video for Back To Me. Of Mice & Men Pack 01 can be purchased for $5.49. Back To Me can be purchased for 25% off for the first two weeks of sale. Songs can be purchased individually for $1.99 each. Back To Me is also featured in the Rock Band Rivals Season 8 Spotlight Pass which can be purchased for $16.49. Entitles purchaser to 12 songs over the course of season 8, all songs needed for seasson 8 spotlights. This song is free after purchase of Spotlight Pass.